The ACT is accepted by all colleges and universities – in 2012, more students took the ACT than took the SAT for the first time. 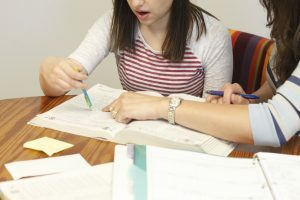 Even though the SAT and ACT share grammar, math, and reading content, the differences in the formats of the two tests require students to do separate preparation in most sections. ACT preparation can be a great way to not only boost a student’s scores, but also to boost his or her academic knowledge. The ACT is curriculum-based, and its questions are presented in a straight-forward, concrete way, making it a great option for hard-working high achievers who do not test well. While applying strategies and techniques can be helpful, students benefit most from directly applying their knowledge of grammar, math, and science. The challenge of the ACT lies in the fast pace students need to work and the vast amount of content required to retain. We provide a thorough review of the most commonly-tested grammar and writing concepts. Many students comment that they learned more grammar through our program than through years of schooling, mainly because grammar instruction is no longer emphasized in most English courses. The ACT Math is a fair balance of arithmetic, algebra 1, advanced algebra, and geometry–unlike the SAT, which heavily emphasizes algebra. Trigonometry is tested to a lesser extent. We review the math content that your student needs the most, help put formulas to memory, and introduce efficient strategies and alternative approaches. The ACT Reading is a fast-paced test of short-term memory. While we teach active reading strategies for improved comprehension, our focus is to teach students how to approach each different passage type for speed and accuracy. ACT reading questions and answer choices are posed in a straight-forward way; the challenge is recalling major ideas and minor details while working quickly. Our different pacing strategies can come to the rescue. Students who score high on the ACT Reading tend to be fast readers, concrete thinkers, and visual learners, but all types of readers can reach their goals with the right plan in place. The ACT Science, a bit of a misnomer, tests a student’s ability to read and interpret data represented in charts, graphs, and tables in the context of science experiments. This is, by far, the section that can be improved the most by practice with technique. We teach a specific approach that helps students prioritize and work efficiently, and we refresh basic science concepts and the experimental method. The ACT Essay, although optional, is sometimes requested by colleges. It’s a 40-min writing task, which requires the student to pick a position on a topic, support that position with evidence, and address counterarguments. The Essay is scored separately from the multiple-choice sections, and the essay score is not factored into the overall composite score. Therefore, the essay score will not impact the student’s overall ACT score. Here are a few examples of different levels of tutoring intensity and duration to help clarify expectations. Example #1, Low-intensity: Your child prepares for one ACT subject, like Math, and tutors 1 hour per week for 8 weeks. The probable result would be a 4-point gain in the Math score, which would produce a 1-point gain in the composite. If this student started with a 22 composite, he now has a 23 overall ACT score. As you can see, a single subject area focus can only “move the needle” so much. Is it possible that an 8-week subject area focus could produce more gains? Yes, but not likely. If a student would like to raise the composite by 3 points, from a 22 to a 25, with low intensity prep, he’d need 4 rounds of a subject area focus. This lengthens the process to up to 8 months of duration. Example #2, Medium-High Intensity: Your child would like to raise his composite score 3 points from a 22 to a 25. This requires a 12-point subject gain spread out among the subject scores. To achieve this, he’d need to raise the math score by 3, Reading by 3, and English by 3 points, for example. Or, he could raise Math by 7 points and English by 5. There are many different combinations for how a 12-point subject score gain can be accomplished. See the table below for recommendations for this scenario. A common prep schedule in this case would be 1.5-2 hours a week for 3-4 months. Example #3, Highest Intensity: Your child would like to raise his composite score by 7 points from a 22 to a 29. This requires a 28-point subject score gain, most likely even distributed between the 4 different subjects, meaning each subject (English, Reading, Math, and Science) would need to improve by 7 points. This level of gain usually requires two rounds of prep (two 3-4 month prep periods) and possibly 40-60 hours of tutoring.